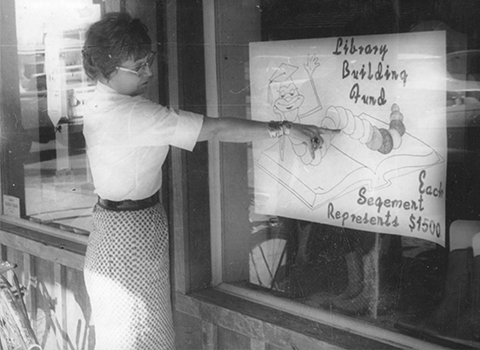 In 1969, the Gilbert Enterprise was replaced with a new name, Gilbert Roundup, by Tom Arnett as the owner and publisher. It might interest you to know that the rate for a one-year subscription was only $3.00. 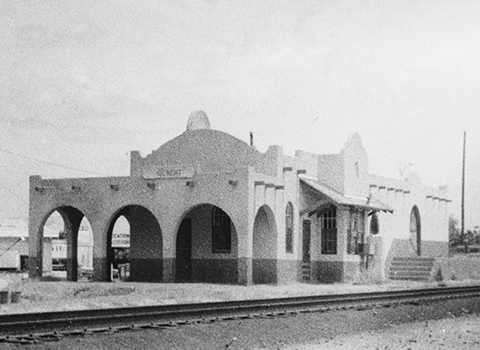 Shortly after the name change, the Southern Pacific Railroad Company began tearing down the Gilbert Depot. 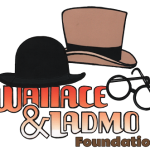 The building had been built sixty-four years before and was a star to our community through those many years. The interesting thing was, we searched for many years for the date of construction of the building. We could find writings that said the depot was built in 1911 and another said it was constructed in 1908, but we finally found several specific recordings proving that it was actually built in 1905. As a matter of fact, an article appearing on October 10, 1969, in the Gilbert Roundup said the depot was erected in 1913. Who knows where they got their information, but, we now know they were off by eight years. The article was right about this little station being responsible for the largest hay shipments in the world during a period from 1914 through 1918. Those were the years we were shipping alfalfa hay to Europe for the Calvary fighting in World War I. 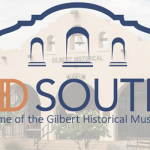 In 1967, the predecessor to the Gilbert Roundup, the Gilbert Enterprise, waged a running battle with the Southern Pacific Railroad Company in an attempt to keep the old building as an historical landmark. The article says trains hadn’t stopped at the Gilbert Depot for many years, and that the building hadn’t been painted since 1945. My memory during the years we were fighting to keep the depot, from my point of view and the Gilbert Chamber of Commerce’s position, was that we asked them to allow us to use the building for a museum, a library and/or for club meetings. We received very little interest for our concern. The Gilbert Town Council was willing to lease and remodel the depot on a five year lease basis, but was informed by Mr. R. O. Coltrin of the railroad company that it was not their practice to give long term commitments. They wanted to give a one year lease that could be terminated by either party with a thirty day notice. The Town Council refused the offer as they couldn’t, with good conscience, invest money for improvements under such stringent rules. So, as you see in the above photograph, the roof has been raised and the east section of the Gilbert Depot has already been torn down. One of the red bricks used to build the depot is in the library at the Gilbert Historical Museum, and on the back of the brick, one of the laborers had scratched in “1905”. 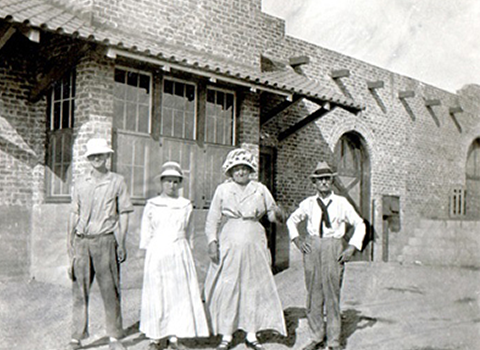 The Gilbert Depot was the forerunner of the development of downtown Gilbert as the merchants received a great deal of their sales items by rail in the early days. 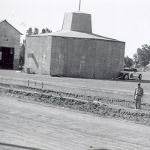 The depot also served the agricultural area in shipping out other products besides alfalfa hay. As a boy, I remember watching men load watermelons and cantaloupe into the boxcars for shipment to people as far away as New York City. Well, I imagine they may have gone that far. The Gilbert corrals were located about an eighth of a mile southeast of the depot, and at that location thousands of sheep and cattle were loaded into cattle cars for shipment. 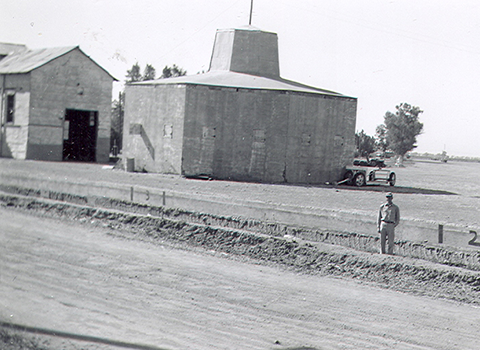 The corrals were very active during the 1930s through the 1950s. In those days, the Erramuzpes drove their sheep right down Elliot Road from their fields east of the corrals to the loading pens. Cattlemen, like the Anderson’s, Gibson’s, Bowens and others, drove their cattle from the desert east of the third canal down Guadalupe Road or Elliot Road to the same pens for their shipment by rail to market. 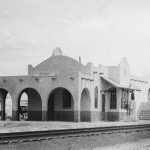 I often think of what could have been, as I remember the beautiful Gilbert Depot with its Spanish Colonial style construction and the hustle and bustle of shipping and receiving that took place in and around that old building. I miss the Gilbert Depot very much and realize it has now been gone for over forty-six years. Darn!